I just realized that you could probably call Ghostbusters for aliens as well as ghosts. Aliens in your neighborhood are strange. They’re weird, and things usually don’t look good when they show up. An invisible man sleeping in your bed? Alien with active camo. Active camo aliens? Or Freddy Mercury singing “Invisible Man”? Some people manages to get money out of flash games, you could look on newgrounds if you can find a good programmer and sound artist if they’re interested, and your art style fits flash games a lot. Why don’t you try spraying them with bacteria? What happened to the Questventure? It’s a lot more work-intensive than I had originally planned for, so I’m posting other stuff while I work on it. 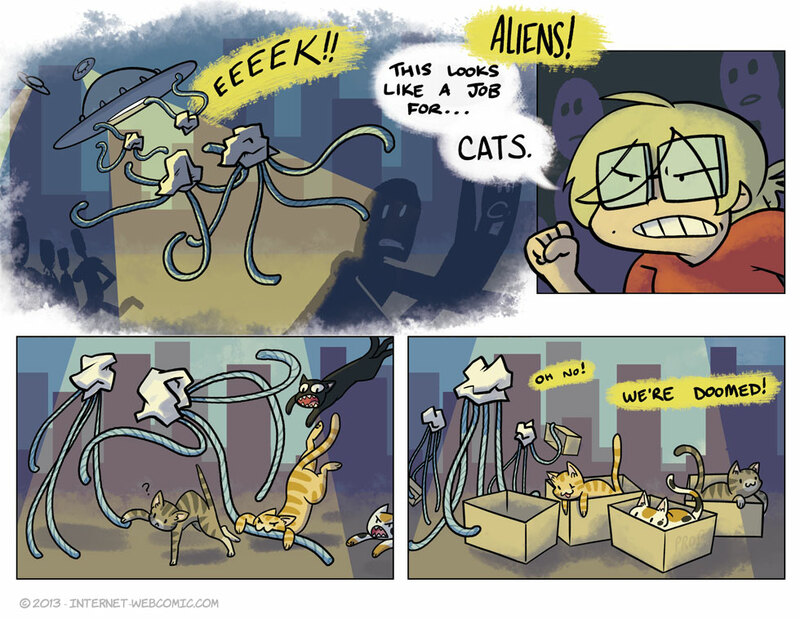 And the alien plot to steal the worlds cats continues to go to plan.